FILE - a man walks by a billboard displaying a Chinese company developed packaging machinery for local and foreign food and beverage companies at the International soybean exhibition in Shanghai. China has made a series of market opening pledges over the past week, but analysts said the moves are unlikely to help Beijing and Washington take any steps toward resolving their differences or advance negotiations. Instead, frustrations are growing as punitive trade actions pile up. China has pledged specific steps to open up its financial and insurance sector with milestones set for June and again before the end of this year. It has also addressed a key concern of President Donald Trump, pledging to significantly cut 25 percent tariffs on automobile imports this year. Beijing also says that by 2020, electric vehicle automakers will no longer have to enter into a joint venture to avoid tariffs and gain access to the Chinese market. However, the moves have left few impressed, analysts said. Paul Haenle, director of the Beijing-based Tsinghua-Carnegie Center for Global Policy, said that until tangible action is taken, the U.S. will continue to be skeptical that such announcements amount to anything more than symbolic gestures that will take years (if ever) to materialize. “Beijing has shown again and again that they are only willing to make significant policy changes when it is in their interests to do so, not in response to international pressure (something we have seen play out in their approach to the Korean peninsula),” Haenle told VOA in an emailed response. With Chinese companies now dominating the financial and insurance sector, allowing foreign companies to come in is less of a threat and ultimately will benefit domestic enterprises more than it does foreign companies, analysts said. The move will also help insulate China against complaints at the World Trade Organization for its long-delayed refusal to open up the sector. It is also likely to be a welcome relief for the finance sector where risks and ballooning debt have been a persistent concern, analysts said. 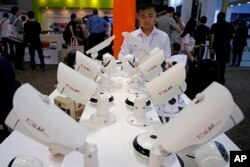 FILE - a man looks at security cameras at the Global Sources trade fair, a trade fair where Chinese manufacturers meet western buyers in Hong Kong. Some see the moves as a sign that Beijing is responding and is serious about pushing forward with its efforts to open up market access, said Erlend Ek, a trade research manager at the research group, China Policy. China is “actually using this pressure to push the SOEs (State Owned Enterprises) and push the domestic protectionists and that might take some time, but it is in their national interest to open up,” Ek said. Analysts note that while the trade rhetoric on both sides continues to heat up, the two sides are still talking behind the scenes. However, growing frustrations are making that increasingly difficult, they said. The United States wants a more reciprocal relationship and for Beijing to tone down its Made in China 2025 industrial policy, said Haenle. The United States and other countries argue that Made in China 2025 discriminates against foreign imports and forces technology transfers. The Chinese also feel they've already made significant concessions to lower the trade deficit and now are beginning to wonder if the debate is more than a matter of U.S. domestic politics and technical economic issues. That concern reached near fever pitch levels this week as the United States announced a seven-year ban on the sale of American components to Chinese cellphone maker ZTE Corporation. But more investigations are underway, notes Xu Chenggang, an economics professor at the Cheung Kong Graduate School of Business and the pressure on Chinese companies will continue to build. Earlier this week, The Wall Street Journal reported that the United States may launch a fresh trade complaint into China’s restrictions on cloud computing and high-tech services. Chinese strategists see trade frictions as a fight for dominance in the next wave of technologies such as big data, cloud computing and artificial intelligence (AI), said China Policy’s Ek. China's massive population and market is a huge advantage in developing data, AI and so on, Ek said. It is a huge carrot that the Chinese government can use to compel foreign companies to accept strong-arm tactics on market access. It is also large enough to nurture information technology companies in a protected environment at home until they are ready to go abroad.